Yes, Prince himself once sang those very words and this weekend the upper Midwest got a giant dump of the white stuff and can I just say this: SO glad it happened on a weekend when there was no need to go anywhere for any reason. On Saturday, I never changed out of pajamas. I worked. I made some cards. I filmed a process video and found out later that half the clips went missing and I may have uttered a few words that might not be deemed lady-like. In other words, a fine day in the life. I’m sure spring is coming. That’s what everyone is saying. Meanwhile, I’ll take the cold and promise not to piss and moan in July about the heat and humidity. Or I will. It’s never a good idea to plan your future before it’s arrived. Also, some people have suggested the Christmas wreath on our garage might be part of the problem. Note to self: get that sucker down, pronto. we’ve had more snow this year than for many years. Beginning of March brought the country to a halt for nearly a week. It wasn’t just the snow it was the East wind blowing it around in a dangerous manner. Media dubbed it “Beast from the East”. However our blizzard was only a wee pile compared to that depth! But now we are to have a ‘heatwave’, it’ll be 25C in South of England this week, but thankfully only around 18C up here in Glasgow. I do NOT do well in the heat either! Shall we expect the video with the ‘special vocabularly’ voiceover? Oh, but without any swears. haha! haha! I wish I could but… you know! I feel for you girl, I remember those days, almost 50 yrs in Syracuse NY, talk about BAD winters, WOW, lol. Unlike you, I HATE snow and cold!!!!!! Yeah, I bet you know! Greetings from the western suburbs, where I feel your pain! Hopefully there is light at the end of the tunnell! There is a light, I swear it’s there! Yikes, we have been very fortunate on the east coast of Canada this winter, at least in my area, southern New Brunswick. However, northern NB still have huge snowbanks. We did have a few weeks of nor’easters in March , which kept me in Florida for a few extra days, lucky me!!. I love your attitude and can sympathize as I have seen many weird and wonderful weather changes during my young 65 years on this planet. Spring will come when it is good and ready, at least no bugs YET! Love your pictures, Cathy. All day Saturday I was texting pictures to friends who weren’t going through this! I’m sure they got sick of me! We seem to have more up in the northern burbs than you do, but bring on the melting! Yeah, it was surprising to get as much as we did but I am thankful it happened on a weekend! Oh Cathy, yohmake me laugh! I live a little north of you in Saskatoon, Saskatchewan so I understand completely. We didn’t get a dump of snow but the icy wind is no fun either. Hang in there. My birthday is on May 19 and there has been snow on the ground on my birthday more than once. Let’s hope not this year. My parents in Milwaukee have been hammered too. BTW, so love your vintage street light. A suburb of Milwaukee used to have those too. Still time for cozy soups and fires. Soon enough it will be hot! They put those in a number of years back when they redid our sewers and streets. I love it, too! I’m so thankful we didn’t have hardly any snow. It snowed lots in the mountains – so great snow pack. We have had lots of wind and it has been pretty grey which is unusual for us here in the desert. I’m looking forward to much less clouds and wind. Golfing when the wind is blowing 25 miles an hour isn’t my cup of tea! It can always be worse and I’m thankful I get up each day to hopefully find some bright spots in this thing we call life! I’m definitely not a hot weather kind of girl, but there are many days where I think aspects would be nice! The weather is weird everywhere! Here is Sydney, Australia we are having a terrible bush fire not far from us and the sun has been beating down like summer. Some say we are skipping Autumn this year! I hope not as like you I prefer the cold to the heat. My family and I were in Quebec for Christmas and loved every bit of the deep snow and storms. But you will get the Spring and Winter here will catch us aware. Looking forward to watching your new video and see the card, you inspire me to get my craft on! (it’s been untouched for a while now). I have hear you are dealing with a lot of heat down there! 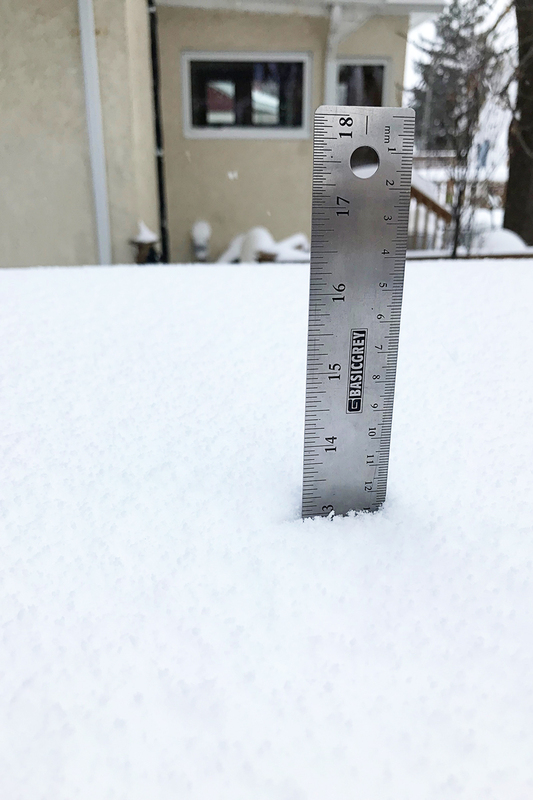 Send 6.3 inches my way to Erie, PA. We need to break 200 inches! So close, yet so far! Love your blog, Cathy! I’ve been following you for YEARS. Keep inspiring us! Oh if only I could! Lol! Thanks for still following along. We don’t have the snow but oooooohhh the rain. I am hoping not to lose all of it but a few days to dry out and get the lawn mowed before it becomes a hay field. We got a total of 10 in of snow this past winter, but the Mt are now getting a lot of snow and we get the rain, cold rain. I am new to your blog but am loving it keep up the good work. Hey Ellen! Glad you found my blog! Can’t believe, it is supposed to be Spring, hopw you have better weather soon! BasicGrey got it all wrong. How is that even possible? 😉 The ruler is supposed to state “cm” (centimeters) not “mm” (milimeters). Lol! Never noticed that! I still love that ruler beyond all others. It’s magnetic on the back. 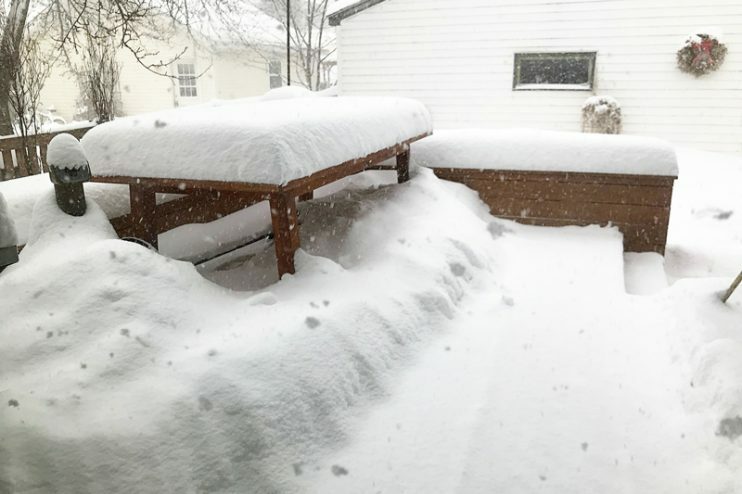 One of my most distinctive childhood memories of snow is of my mother going out onto the patio to stick a ruler into the snow accumulated on the top of the picnic table. Seeing your photo of that ruler in the snow brought a smile to my face! I’m one of those weird hot weather loving people. I’ll go outside in the 90 degree weather and put my bare feet on the concrete to feel the heat seep into my bones. It goes without saying that I’m a giant baby when it snows here in NJ. 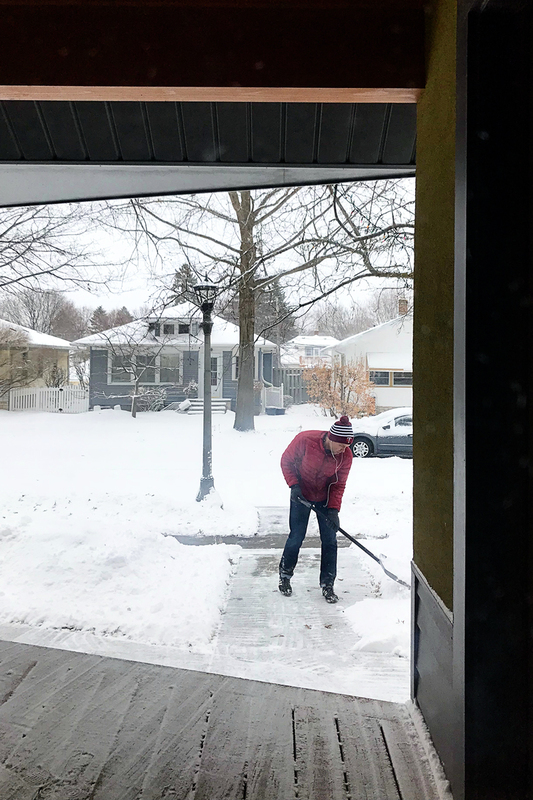 My husband, a Michigan native, has no pity for me when I whine over 6 inches of snow. I’m glad someone else (You!!!) remembers that utterly beautiful, often forgotten Prince song! Down in Indianapolis we’ve had multiple days of snow and I’ve thought that song each and every time I’ve seen a flake! Oh yes, it’s one of my favorites of all time. In college, i once played it on a loop for about three hours.